The Resident Tourist: This is Why I Love New York . . .
After a long, wet day, I came home utterly exhausted. I decided to forgo my party plans and stay in for the evening. I got into my coziest pair of cashmere sweats and dedicated myself to magazines and trashy television for the rest of the night. As I was getting ready for bed (lights out an all), my room suddenly filled with a brilliant blaze of red. 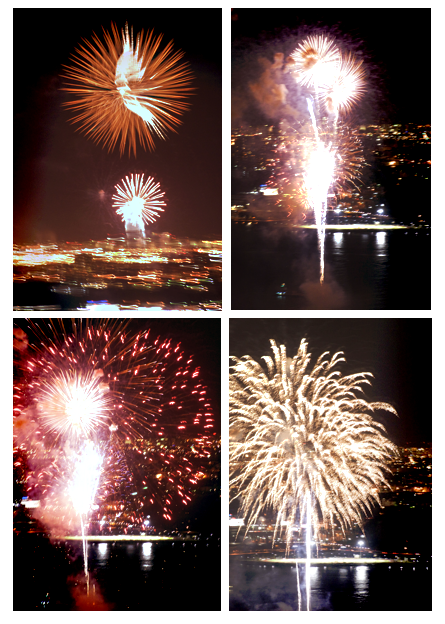 For a split second I thought it might be the apocalypse, but when I looked out my window I was surprised to see a beautiful display of fireworks over the Hudson. I have no idea what the occasion was, but I was more than happy to enjoy the show before tucking back into bed.